Katie Two or "KT" was named after Debby Jusick's outstanding foundation dog, Katie, who died a tragic death. Not only does she have the first Katie's looks, but temperament, attitude, smarts, and quirks. Hence the name Katie Two, abbreviated into the name KT -- which sounds a lot like Katie, but for sentimental reasons was not named Katie directly. 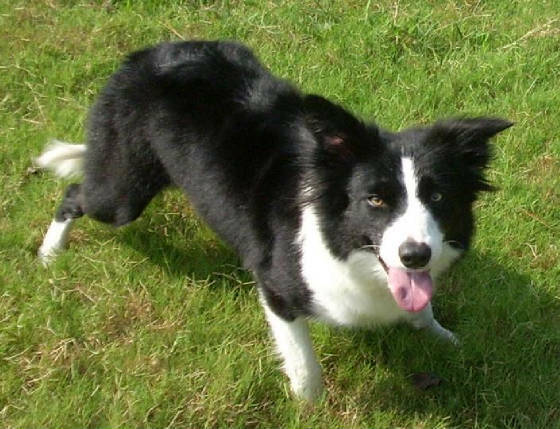 KT is a beautiful rough coated, black and white female with close to perfect markings. She is fun, loving, outgoing, and very comical. KT has a great sense of humor and LOVES her human companions. She is currently learning frisbee and agility and is very talented at both. She picked up the basics of dog agility in a matter of minutes. She is ready to compete at Jumpers Level. She is working on some tricks with the frisbee and has already shown great potential for competitions. Where did we get KT?? Originally KT was purchased from a breeder in Indiana with great dogs from some of the greats, then sold to Debby Jusick of Debby's Dogges, and now she is affectionately owned by us! Any planned future litters out of her?? KT and Lad had a fantastic litter this past April. So KT will be taking a break from pups this next heat cycle. But look for another awesome litter from KT, possibly with Debby's stud dog Freedom.